Clove has long been associated with aiding relief from the symptoms of colds and chills, while Cinnamon, regarded as a restorative, can be of help to those left weak and tired after an illness. 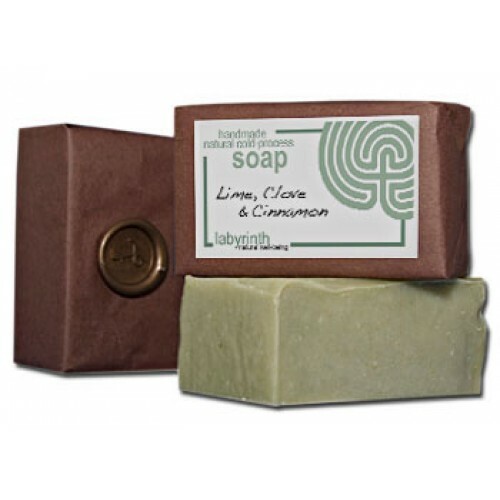 Lime is credited with benefiting a sluggish circulation and, joined with the antiseptic nature of Clove, can assist the treatment of skin infections such as acne. Lime’s toning qualities are also valued as an aid in the fight against wrinkles. Suitable for all skin types - particularly good for oily skin. Olive Oil (Sodium olivate), Coconut Oil (Sodium cocoate), Regulated Palm Oil (Elaeis guineensis), Spring Water (Aqua), Lime (Citrus aurantifolia), Clove Bud (Eugenia caryophyllata), Cinnamon (Cinnamon zeylancium), Spinnach Powder (Spinacia oleracea). Naturally Occuring: Eugenol, Benzyl benzoate, Cinnamal, Cinnamyl alcohol, Citral, Isoeugenol, Geraniol.